A sash window is a type of window with movable panels known as sashes. Sashes open by sliding up and down or by swinging outward. 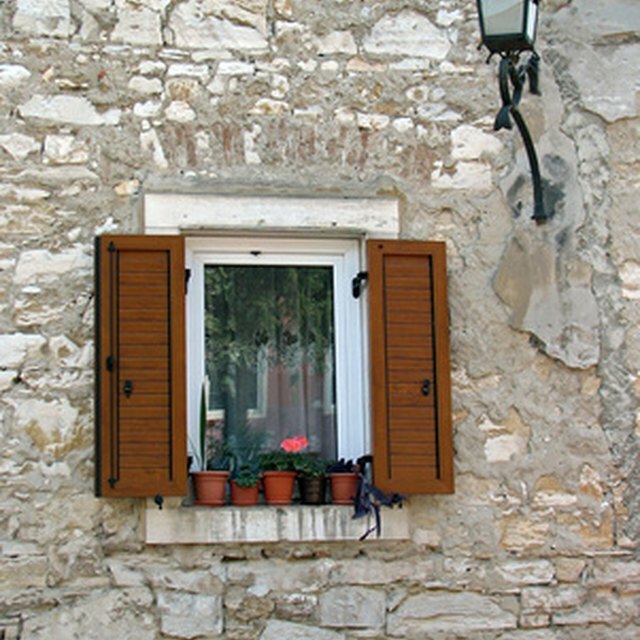 These types of windows are typically found in older homes. Typical problems for sash windows include wood rotting, swelling, shrinking and distortion. According to "This Old House," sash windows are known to be drafty and can often refuse to budge. Repairing a sash window improves its functionality and can make it more energy efficient. Replace window sashes on old, drafty windows. Unscrew the moldings in front of the lower sash and pull out the lower sash. Remove the sash chains or cords from both sides and knot them. Remove the vertical strips holding the upper sash and pull out the upper sash. Remove the sash chains or cords from the upper sash. Remove all sash hardware from the window and place it in a labeled bag for safe keeping. Use a heat gun that has been fitted with a nozzle shield and set to "medium" to soften the glazing compound on the window. Use a putty knife to scrape away the glazing compound until the metal glazier's points are exposed. Remove them from the wood, then slide the glass out. "This Old House" suggests labeling the glass to remind you how it should be replaced. Clean out sash joints that are loose or open by removing any soft or rotten wood using a rotary tool. Use a paint brush to apply a coat of epoxy wood primer to the wood joints, then allow the primer to set for 20 minutes. Use a plastic scraper to mix together equal parts epoxy wood filler---resin and hardener, until it's thick yet pliable, then press it into the wood joint. Use the scraper to spread the epoxy over the sides until the joint's original shape is restored. Epoxy wood filler, also called epoxy wood consolidant, consists of resin and hardener, which are stored in separate containers, but are generally packaged together. Place pieces of Plexiglas over the epoxy and allow the epoxy to harden overnight. Remove the Plexiglas, then use a utility knife to remove any excess epoxy. Wait about 24 hours until the epoxy is fully cured, then use 100-grit sandpaper to sand the sash. Use a cloth to remove all dust, then apply a coat of oil-based primer to seal the wood. Place the sash exterior side up on a flat surface. Use your hands to roll a generous amount of glazing compound into a long rope, then apply it to the groove around the pane opening. Place the glass pane evenly into the compound, about one-sixteenth of an inch from the bottom of the groove. Slide at least two evenly spaced glazier's points on each side of the glass using a putty knife, then push them into the wood sash point first. Use your hands to roll a generous amount of glazing compound into a long rope, then apply it around the edge of each pane. Run a putty knife over the glazing compound between the glass and sash to make a smooth bevel. Allow the glazing compound to dry for at least a week, then use a paint brush to apply a coat of oil-based primer over the glazing compound. Once dry, use a paint brush to apply a coat of acrylic latex paint over the glazing compound and sash. Place the weatherstripping back on the window sash, if applicable. Wash the hardware in liquid soap and water, then reattach it. Use silicone spray to lubricate the pulley axles. Reattach the chains or cords to the upper sash, then reinstall the vertical strips. Hook the chains or cords to the lower sash, then put the moldings in front of the lower sash back on the jamb to keep the sash in place.